Come check out plural (love) by Kristine Haruna Lee and directed by Morgan Green as part of the New Georges Jamboree! Kristine and Morgan will be sharing 15 minutes of this brand new piece along with their other Jam cohorts at Dixon Place May 17th at 7:30pm! Thanks for coming to Memory Retrograde! We had a wonderful, sold out run of Memory Retrograde! Thanks to everyone who made it out, to the cast and crew, and to BAX for housing us for the last two years through this incredible residency. 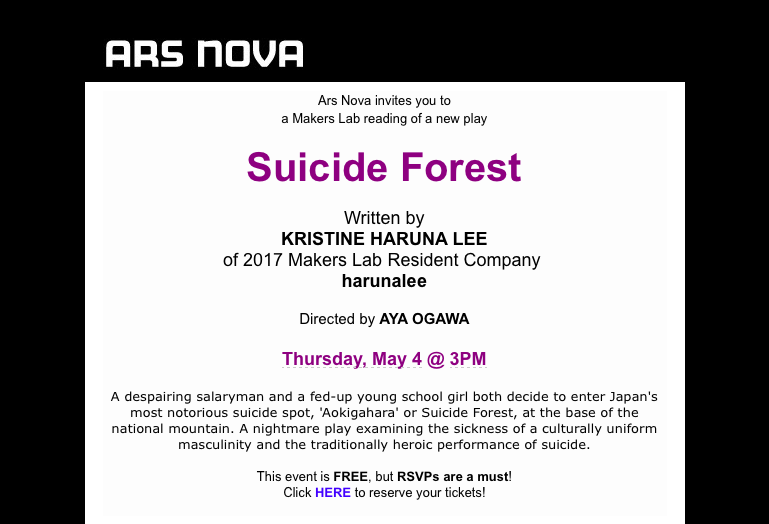 As part of the Makers Lab Residency at Ars Nova, we will be sharing a new play by Kristine Haruna Lee titled Suicide Forest Directed by Aya Ogawa, at Ars Nova May 4th at 3pm. The play will be read by an all Japanese/Japanese heritage cast. A despairing salaryman and a fed-up young school girl both decide to enter Japan's most notorious suicide spot, 'Aokigahara' or Suicide Forest, at the base of the national mountain. A nightmare play examining the sickness of a culturally uniform masculinity and the traditionally heroic performance of suicide. The Reading is free, but we ask that you make a reservation here. Thanks to all our donors! Thanks to our amazing 131 contributors, our goal was funded by 103% and we are now headed into tech for Memory Retrograde with a huge sigh of relief. THANK YOU. We hope you can join us for the showings on April 28th and 29th, 8pm @ BAX. Tickets are now on sale and can be purchased here. Hope to see you next week! Congrats to Kristine for receiving the Lotos Foundation Prize for Directing! The Lotos Foundation Prize in the Arts and Sciences recognizes institutions and individuals working in New York City for distinguished accomplishments and exceptional talent in the arts and sciences. Help us launch Memory Retrograde! We're gearing up for our showing of a new play titled MEMORY RETROGRADE on April 28 + 29 which closes our residency time at Brooklyn Arts Exchange. For the past 2 years, we've been creating this brand new piece from scratch and have been working towards this epic 3-part showing. We need your help to put this play up so we can invite folks into the room who can advocate for a full production in New York City in the very near future! Thanks for supporting our February workshop of Memory Retrograde at Brooklyn Arts Exchange! We learned so much from sharing this material, and we're looking forward to sharing it in full on April 28 + 29. Stay tuned! Jess Almasy and Ugo Chukwu in Memory Retrograde. Photo by Sasha Arutyunova. harunalee is Ars Nova's 2017 Resident Artist - Makers Lab! We are thrilled to be joining the Ars Nova family in their inaugural Makers Lab! This lab provides a dynamic group of generative theater artists with individually tailored residencies for the next year, designed to holistically support their careers and develop their new works. Thanks Ars, can't wait to get started! Learn more about The Makers Lab and the other resident artists here. A collaboration between Aoi Lee & Kristine Haruna Lee. Also featuring Maxwell Cosmo Cramer & Storm Thomas. Kristine Haruna Lee will be collaborating for the first time with Aoi Lee on a mother-daughter piece. They will be in residency together for two weeks at BAX developing a performance inspired by AL's butoh and KHL's writing. They will begin this process through images rather than conversation, as a way to bypass Japanese-English language barriers between the two of them. They will focus their findings on 'female metamorphosis', and it's relationship to reincarnation, memory, and spaces of 欲 (yoku) or desire. Read an article in The Brooklyn Rail about BAX's 25th Anniversary and the AIR Open Studios by Jess Barbagallo, including excerpts by Kristine Haruna Lee. harunalee wins an indie theater fund artist pay grant! On October 11th, we won one of ten Artist Pay grants from Indie Theater Fund through a drawing of 100+ indie companies based in NYC working with key collaborators of color. Thanks Indie Theater Fund! Become a member to find out more on how to apply for this grant and become part of the community.